Dr Joanna Swabe is Senior Director of Public Affairs and Manon Dené is a wildlife policy specialist at Humane Society International/Europe. It is hard to imagine the savannahs and woodlands of Africa without thinking of graceful giraffes roaming across the vast African plains and browsing the tops of trees that no other herbivores can reach. Yet we might have to, for the future of these charismatic giants is in jeopardy. The tallest living terrestrial mammal in the world has lost large swathes of its habitat to human development. In addition, too many giraffes are dying for the bush meat trade, as well as for an international commercial trade in the species’ distinctly patterned skin, bones and tails for jewellery, carvings and other trinkets. A 2018 HSI investigation uncovered a thriving international trade in giraffe body parts. Over the past decade, close to 40,000 giraffe parts were imported into the US, including 21,402 bone carvings, 3,008 skin pieces, and 3,744 hunting. Investigations show that online and in store products most frequently offered for sale include giraffe bone knife handles, giraffe taxidermy, and giraffe skin Western boots, furniture, and even bible covers. Products ranged in prices from $8,000 for a partial giraffe taxidermy trophy to $10 for tail-hair bracelets. Most giraffe specimens imported by the United States in the past 10 years originate from South Africa, Zimbabwe, Tanzania and Namibia. Although no unified wildlife trade database exists in the EU, online research conducted in 2018 revealed giraffe products for sale in seven Member States, including Belgium, France, Germany, Greece, Italy, Spain, and the UK. This survey found over 300 products for sale across these seven countries, including giraffe bone pieces, knives with giraffe bone handles, bone carvings, skins and trophies. It was not so long ago, in 2010, that the IUCN Red List classified the giraffe to be of “‘Least Concern”. However, by 2016, the situation had deteriorated so badly that the species was upgraded to “Vulnerable” to extinction with population decline between 36% and 40% over the last 30 years. Fewer than 100,000 giraffes remain in the wild and the declines are ongoing. 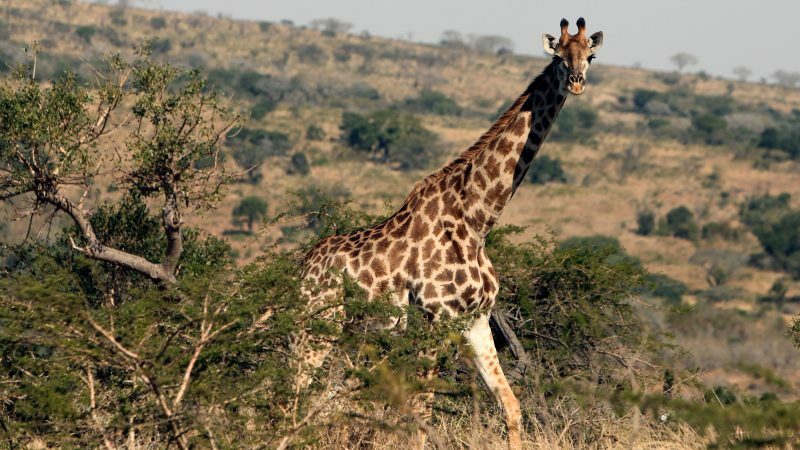 Imposing restrictions and controls on the international trade in giraffe parts and products through amending the appendices of the Convention on International Trade in Endangered Species of Wild Fauna and Flora (CITES) would be an important step towards halting this decline and protecting this threatened and cherished species. In that regard, the decision of the governments of Chad, Senegal, Niger, Mali, Central African Republic, and Kenya to place the plight of the giraffe on the agenda of the CITES Conference of Parties (COP18) meeting in Colombo, Sri Lanka this May is wonderful news. The giraffe proposal from these African range states is modest. They are seeking an Appendix II listing, which would regulate rather than ban the international commercial trade of giraffe specimens outright. This deserves majority support from the 183 Parties to the CITES convention. With a (post-Brexit) voting bloc of 27 Member States, the European Union plays a decisive role in CITES decision-making. Without the EU’s support, CITES proposals do not have a great chance of reaching the two-thirds majority vote necessary for adoption. Right now, the European Commission and Member States are discussing all the COP18 proposals in order to reach a common EU position. This week, a delegation from Senegal and Niger are in Brussels to meet with the European Commission and Member States to convince the European Union to support this important proposal. The key African range states have already stuck out their necks to save the giraffe. It’s time for the European Commission and Member States to do the same.